Welcome to beautiful Sanibel Island! Discover paradise on the sunny southwest side of Florida with beautiful sandy beaches and seashells of all shapes and sizes. Take a leisurely stroll or just sit back and relax on the beautiful warm sandy beaches while watching the birds and dolphins. Or spend a quiet afternoon collecting shells. Sanibel Island is known as one of the best shelling spots in North America. 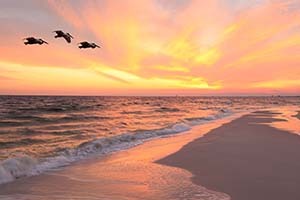 U.S. News named Sanibel Island #6 in Best Relaxing Getaways in the USA and #3 in Best Florida Beaches. Enjoy access to plenty of water activities like boating, kayaking, snorkeling, scuba diving, swimming, and fishing. The popular Lighthouse Beach Park is home to a working lighthouse and has a great nature trail to explore. If you like to golf, The Dunes Golf & Tennis Club features breathtaking views and an 18-hole championship course for all skill levels. The J.N. Ding Darling Wildlife Refuge provides an education center, wildlife drive, hiking trails, and guided tours on kayaks, canoes, and paddle boards. Don’t miss out on exploring Periwinkle Place Shops, which features over 25 boutiques and some excellent dining spots in a park-like setting. The Sanibel area is dotted with adorable shops and restaurants. You’ll also find a variety of cultural activities on Sanibel Island including theater, arts, and live music. For more information about Sanibel Island, or if you’d like to learn about local real estate opportunities, call Phaidra McDermott at 239-898-3778. Explore the Sanibel Island Beaches! Sanibel Island is famous for its natural beauty, award winning beaches, and some of the best shelling opportunities in the world. Get ready to sit back and relax in the sun, enjoy some water activities, or do a little bird watching on Sanibel’s beautiful beaches. A popular place for shellers and fishermen. You’ll find these beaches on the Sanibel & Captiva side. Swimming is not advised due to the swift currents. You’ll find plenty of peace and quiet on this isolated and picturesque beach. Enjoy great shelling and plenty of nature trails to explore. Also a great spot for canoeing, kayaking, and picnicking. A great spot for swimming, windsurfing, canoeing, kayaking, and fishing. Other popular activities include dog walking (on a leash), picnicking, and dolphin watching. Free parking. This beautiful secluded beach features picnic tables, barbeque grills, and a shaded pavilion. Free public bike racks. This family friendly beach is home to our historic functioning lighthouse built in 1884. A good place for shelling, swimming, fishing, sailing, windsurfing, and picnicking. Features oversized parking for recreational vehicles with just a short hike to the beach. Bike racks and picnic areas. 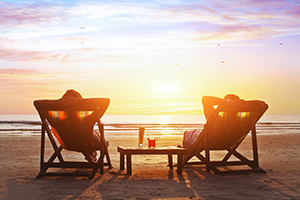 Learn more about the Sanibel Island beaches. If you’d like to get information on Sanibel Island real estate opportunities, contact Phaidra McDermott today! 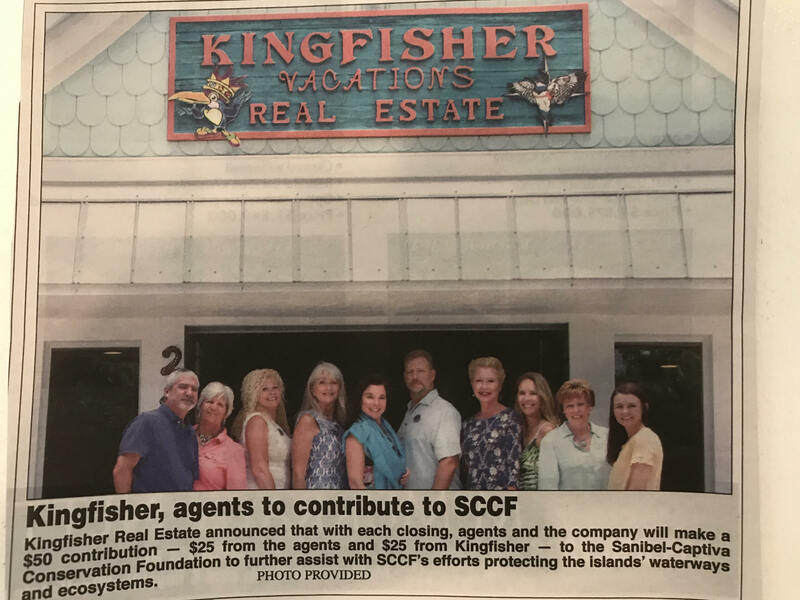 With every closing at Kingfisher Real Estate, the agents will be donating a portion of their commission to The Sanibel and Captiva Conservation Foundation. The Company will be matching each donation made by the agents to help SCCF's mission to improve water quality and protect wildlife.